These Torsion Springs are a 3-Piece Design and have have a wide range of uses, including Suspending Safety Mesh and Swimming Pool Covers. 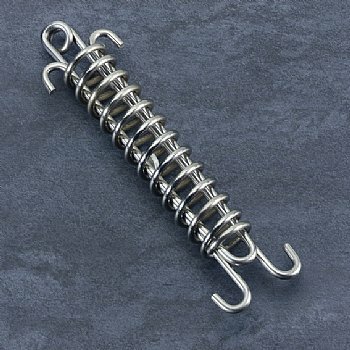 These springs are approved by HM Prisons and the home office for use in safety mesh mounting and as such are an approved contractors spring. - At 220 Pounds it is compressed to approximately 1 Inch. - At 400 Pounds (full load) it is fully compressed to 2 Inches; returning back to original shape/size when unloaded. Q: Can you confirm the spring rate for this please?